AnyLogic is a software platform for business simulation modelling of any scale and complexity. 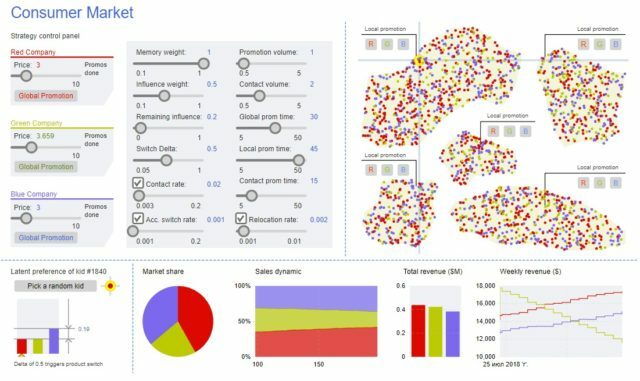 It brings together and combines modeling methods and visualization tools so that one can create simple support models without additional tools. Agent modelling – for models with many individual agents/objects. System dynamics – when only global dependencies are known. Discrete-event simulation – if a system may be described as a process. The combination of methods is for complex systems with all the listed features. Presentation of models is done in a visually attractive and understandable form: plans and diagrams, graphics models, 3D models, dynamics and animation. 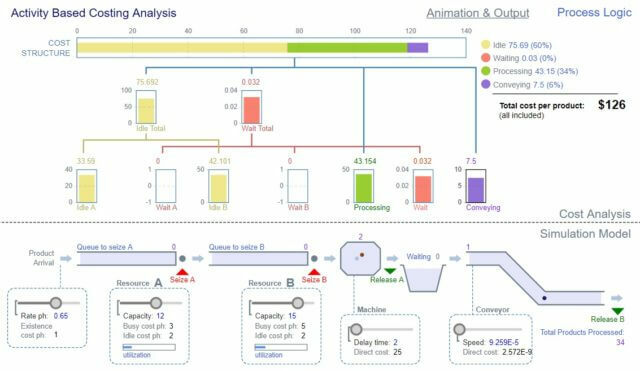 Convenient and intuitive diagrams of processes, state diagrams, flowcharts and diagrams of flows and drives are used. Interactive movies with spectacular 3D and 2D graphics from block diagrams are available. An extensive set of graphic objects for visualization of vehicles, personnel, equipment, buildings, other objects and processes related to your business. Import your own 3D models, images, CAD drawings and shape files into simulation models. Intuitive navigation and controls. Convenient and functional control panels for models. 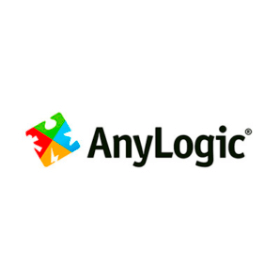 Anylogic allows one to work directly with any database – 1C, Oracle, MS SQL, MySQL, PostgreSQL, MS Access, Excel, as well as with text files. Integration of databases makes it possible to fine-tune the model for a business, allowing to model any scenarios for further development at any point in time. The output data obtained during the modelling process is also easily uploaded back to the database and, for example, to generate checklists or adjust work plans. Simulation modelling at the planning stage allows to determine the optimal parameters of a planned or an existing warehouse, evaluate the effectiveness of a business processes and the proposed measures for its reorganization. The simulation modelling of a warehouse is a three-step process. At the first stage a detailed structure of the model is set up which takes into account the warehouse topology: the exact location of zones, equipment and routes of equipment routes. At the second stage, business processes are defined which determine the functioning of the warehouse: what, when and with the use of what equipment the personnel performs various operations. Then a schedule of the arrival of goods, receiving of orders for the warehouse, with the indication of time, volume, nomenclature is set. 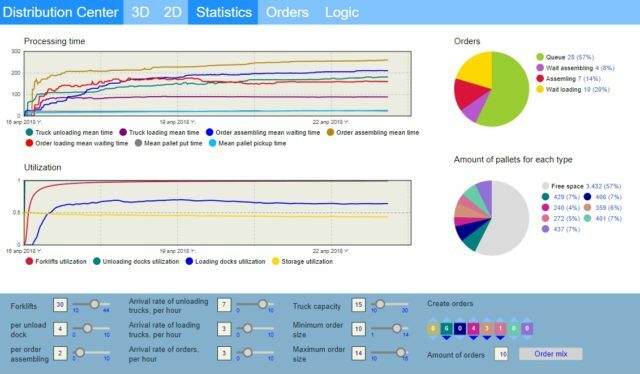 Detailed statistics is collected and displayed when the model process runs, for example, resource utilization factors, time for performing operations. Simulation models are used both before the launch of the large-scale projects, and in the process of their development – at any time you can make changes to the original project and track the consequences of these changes without risking assets and without interrupting any established business processes of a company. 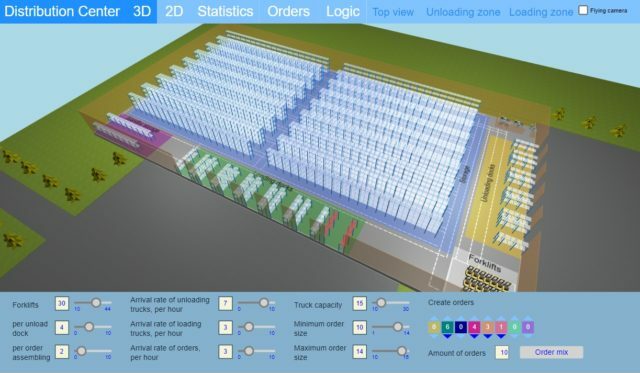 Simulation modelling with the use of AnyLogic offers visualization of any process, which in turn allows to track the work of a warehouse at any point in time. Simulation models are used both before the launch of large-scale projects, and in the process of their development — at any time you can make changes to the original project and to track the consequences of these changes without risking assets and without interrupting any established business processes of a company. Uncertainties in the data are inevitable during long-term planning. A deterministic analytical model requires that all factors which influence the situation are taken into account. In practice, some values are always unknown, therefore, the analytical model is based on assumptions and estimations. Key variables are not always taken into account in the analysis: for example, the unaccounted interdependence of the two secondary factors can lead to serious financial losses. Simulation modelling makes it possible to reveal hidden interactions of seemingly unrelated factors, to test the dependencies of all of the subjects of the model. The results allow to form a deep understanding of the system functioning – a much deeper one than with the use of quantitative evaluation of data with analytical methods. The simulation model makes it possible to take into account uncertainties, to create mitigation strategies for risks and negative scenarios. The model allows one to test any changes which are being introduced into business processes and find optimal scenarios for their implementation. There are many factors which must be considered in order to increase the capacity of subway stations, train stations, airports and shopping centers such as location of service points, walkways, turnstiles, escalators. All of these factors must be considered within the flow of time, while taking into account a multitude of probabilities, spatial characteristics, the speed of movement and interaction of pedestrians with each other. Modelling in AnyLogic allows one to take into account all of these factors and create an accurate model with graphic visualization, test a lot of scenarios and find the optimal configuration of the object. To select the most rational marketing and sales strategy, marketing professionals need to take into account a large number of factors. These factors should be considered dynamically since they change with time. Standard analytical solutions are not able to take into account all of the possible scenarios, predictions made with their help may have significant errors.Simulation modelling allows one to describe all of the involved processes in the most detailed manner, this includes taking into account changes in the processes that take place over time. It allows to accurately predict any market changes for the necessary period of time. The model may be populated with the number of agents which corresponds to the real number of consumers, a conclusion may be drawn based on the interactions of tens of thousands of customers, the behavior of an entire market may be analyzed. Please fill the form and we will give a feedback.